Cape Nagatsuro (長津呂崎, nagaturo saki) is one of the small cape of Jogashima island. At Cape Nagatsuro, you can see great view of Pacific Ocean with Izu Peninsula and Mt. Fuji. Especially, the sunset is one of the best you can see in Kanto area. There are many hiking courses, but the cape is mostly slippy rocks. So, you have to pick up your shoes for hiking here. Also, you can enjoy fishing. All the landscape is chosen as the national treasure of Kangawa prefecture. One of the best fishing spot in Kanagawa. Check out the great monument of nature! The rock beach of cape Nagatsuro is very beautiful. It is preserved by Kanagawa, so all the rock beach keep original shape. 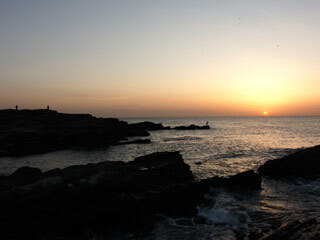 Many people visit here for beautiful sunset, and enjoy great fresh fishes.